Enter in your mobile phone number or e-mail address and we will notify you when Horizontal Mount Single Arm Ball is back in stock. 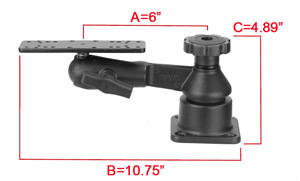 Horizontal mount casting, with a horizontal single swing arm, ending in a clamp socket for standard size ball mount with plate. The RAM single swing and socket arm mount includes a 6" STRAIGHT swing arm mounted on a horizontal surface mounting base. At the end of the mount is a rectangular 6.25" x 2" top base. The pivoting point of the rectangle base allows 180 degree rotation, the swing arm allows a 360 degree rotation.